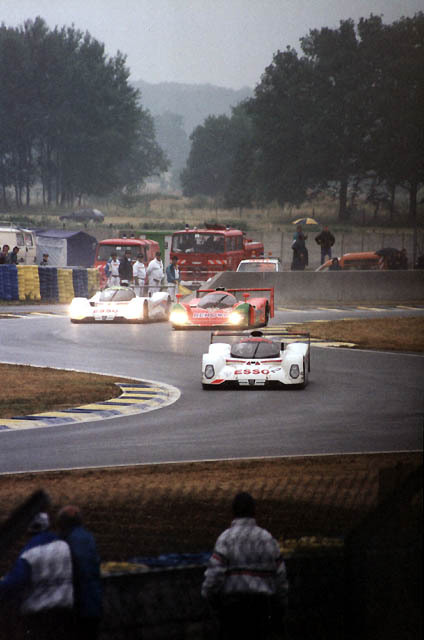 If 1991 had seen a depleted turn out at Le Mans, 1992 was even worse, with only 31 cars arriving for scrutineering. It was with this background that the Tourists in 1992 ended up numbering only two, myself and my good friend Peter (aka Pierre). Ian, our normal Le Mans organiser, finally bit the bullet and decided that with such a poor field, it just wasn't worth going and the rest of the usual team members followed suit. For me, the thought of not going to Le Mans was simply too much to bear, and I was about to go it alone, when Jayne, my long-suffering wife suggested that I should ask Peter. Much to my delight, Peter was very keen to join me. We decided that instead of driving over, we would take the short and sweet coach tour offered by Chequers (soon to become Motor Racing International), primarily because one of their tours happened to pick up in Southampton, quite near to where I live in the New Forest. The first picture you see is that of Pierre sitting in the Maison Blanche grandstand on Saturday morning, just before the start of the morning warm-up. 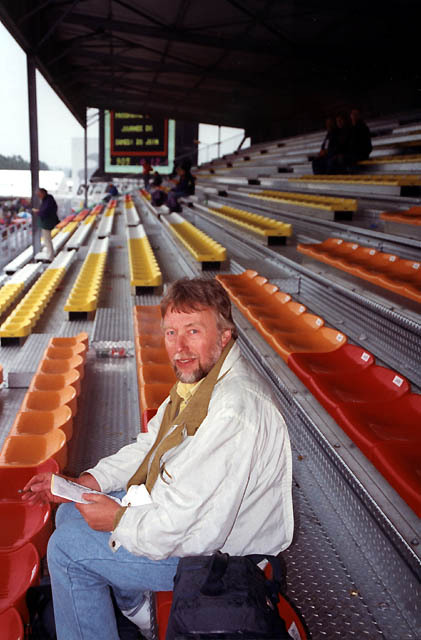 It was the first time I had bothered buying grandstand seats, but they turned out to be invaluable as it was raining when we got to the circuit on Saturday, and it stayed that way for most of the rest of the weekend. 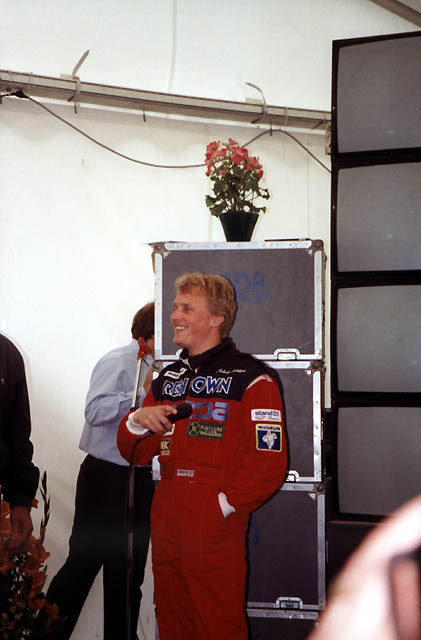 We had the advantage of hospitality from Chequers which gave us the chance to listen to Jonathan Palmer and Johnny Herbert (below). Herbert, a winner the year before, was driving the glorious Jaguar, sorry, Mazda, in that lovely orange and green Renown/Charge colour-scheme. Despite the paltry size of the entry, the opening laps of the race turned out to be as exciting as any Le Mans I have watched. Volker Weidler set off at an extraordinary pace in the Mazda, passing both of the Peugeots (on consecutive laps if I remember rightly). Fortunately for me, both of the passing manoevres occurred at the Ford Chicane, right in front of me, and the picture here shows Weidler passing the No 1 Peugeot for second place. We had to be thankful though for the entry of the three Toyotas, although not as strong ultimately as the Peugeots, the TS010s were magnificent looking cars and made the race worth while. Ultimately, however, the lead Peugeot of Warwick, Dalmas and Blundell was able to stroke its way home 6 laps ahead of the second place Raphanel/Acheson/Sekiya Toyota. Even the weather cheered up towards the end of the race. 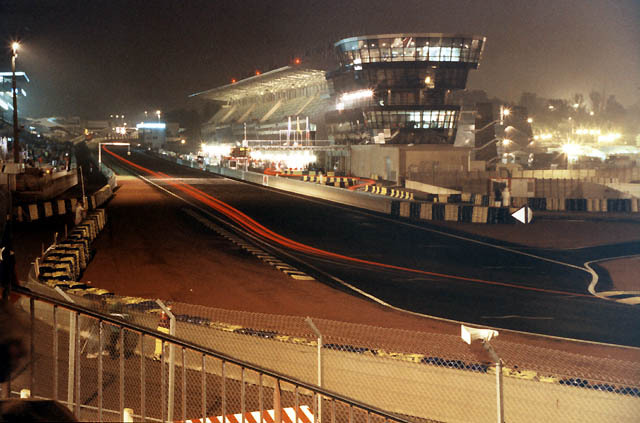 Those who know me will know that one of my passions is taking pictures at Le Mans at night. I guess I'll never get that ultimate light-trail picture now, due to the debris fencing that has sprung up all around the circuit in recent years, but our seats in the Maison Blanche grandstand did give me a perspective I had not seen before, and this is just one of the shots that I took whilst sheltering from the rain during the night. Whilst the trip was very different to those I had taken part in over the previous 6 years, and leaving on Friday night and returning home in the early hours of Monday morning made it an express trip, I certainly enjoyed myself, despite the rain. I was sure that the full team of Tourists would be back together again in 1993.